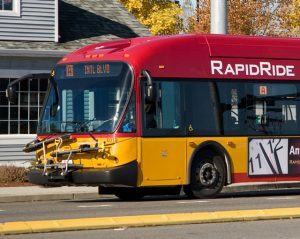 A new report from the King County Auditor’s Office released on April 4th reveals a RapidRide fare enforcement system wholly unable to justify its existence. It is not demonstrably effective, and it is demonstrably costly, harmful, and inequitable. King County spends $1.7 million per year punishing people – predominantly poor people and people of color – who cannot provide proof of payment to the fare enforcement officers who periodically board RapidRide buses. Nearly a quarter of riders slapped with a $124 fine, and over 30% of those charged with a misdemeanor, were homeless or “housing unstable”. According to the report, “the fines for individuals experiencing housing instability totaled just over $290,000 from 2015-2017. These fines, when unpaid, go into collections, which can then impact a person’s ability to obtain housing.” Less than three percent of fines are ever paid. This situation is absurd and despicable. It traps the King County residents who most need public transit and are least able to pay fines. And to what end? According to the report, “research has not found a correlation between fare enforcement and fare evasion”. In other words, there is no evidence that fare evasion rates would rise significantly if fare enforcement simply stopped. The Transit Riders Union calls on King County to establish a two-year moratorium on punitive fare enforcement while a better system is devised. “Fare-checking staff,” previously known as fare enforcement officers, should still check fares so that Metro can track any changes in fare payment rates over that period, but there should be no punishment: no warnings, no citations or fines, no misdemeanors. Perhaps riders who cannot show proof of payment could be handed a leaflet with information about reduced fare programs and where to obtain an ORCA card. “Does it make sense do to this kind of fare enforcement at all?” King County Councilmember Claudia Balducci asked during an interview with KIRO 7. “I don’t know that it makes any sense to be fining people who are coming onto the buses for shelter because they don’t have shelter.” The Transit Riders Union applauds this sentiment and urges the King County Council and County Executive to act swiftly to halt punitive fare enforcement pending further investigation.